Application is due September 28, 2018. due date has been extended to Monday, October 1, 2018, 9am. EnviroLab Asia is a dynamic 5C program that focuses on understanding environmental issues in East and Southeast Asia. We aim to engage communities and explore what comes out of the intellectual exchange between the humanities and social sciences, environmental analysis, and various other fields to generate new scholarship about environmental issues in Asia. This initiative at the Claremont Colleges is entering its second year of a four-year grant funded by the Henry Luce Foundation. The EnviroLab Asia Class is a unique course that embodies a liberal arts approach to understanding environmental issues in Asia. The Class will prepare students to conduct research on the Clinic Trip, which will take place after the end of the Spring semester. 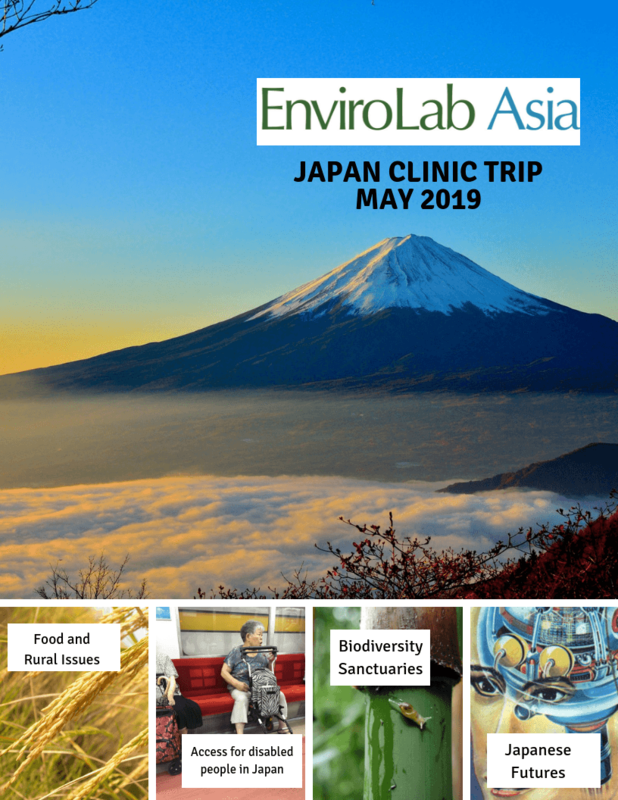 Travel costs will be covered by EnviroLab Asia. The class must be completed successfully by a student before he/she/they may go on the Clinic Trip. Students will be exposed to methodologies from the sciences, humanities, and social sciences. Guest lecturers from different disciplines will also visit the class. Students will also be divided into Class Labs that will work on some type of research project advised by a faculty member. For Spring 2019, the EnviroLab Asia Class will examine environmental issues in Japan. The class will explore the following themes: infrastructure & power, modernity, biodiversity, agriculture, nuclear energy, community, and landscapes. EnviroLab Asia will cover the travel costs of the Trip (airfare, lodging, and meals). Professor Marty Meyer (Biology, Pomona) will teach EA21. The Class will have four Class Labs. My lab will focus on public access for disabled people. I plan to take my lab members to do fieldwork at public facilities, e.g. urban parks, libraries, cultural centers, etc. to examine their landscape and environmental design. For preparation, we will read articles on disability and elderly studies as well as architecture and urban planning in Japan. We will also have a chance to study policies on related issues. My lab will collaborate with the Department of Robotics and the Department of Environmental Design at the Osaka Institute of Technology to conduct the fieldwork. This lab will focus on representations of Japan in both Japanese and American post-WWII science fiction. In particular, we will seek to explore how science fictional imaginations of and from Japan dramatize modernity’s impact on the environment, social codes and norms, and the notion of the “human.” Additional research questions may include: What are the differences or similarities between Japanese and American science fictions about Japan? How does science fiction address contemporary issues such as climate change, technological mediation, political upheaval, and large-scale ecological disasters? And how might science fiction proffer new and alternative ways to imagine possible futures? This Clinic Lab will explore social and natural sciences approaches to understanding the intersection between agriculture, food issues and rural development in Japan and the region. This lab will evaluate the pressures on the environment due to increasing global food demand and changes in diet. We will look at the rise of alternative systems of food production in Japan and other parts East Asia that are ecologically sensitive and community oriented for social renewal in the rural. In so doing, this lab will evaluate policies related to food security/sovereignty, sustainable food production and climate change and protecting and enhancing rural life and culture. My lab will examine patterns of biodiversity across urban landscapes to provide key insights into how to create sustainable cities where all species are appreciated and protected. Specifically, we plan to examine biodiversity in shrine forests and adjacent habitats (urban and non-managed forests) to delineate what constitutes a sanctuary for the other species that share our planet. If you have any questions, please email Karin Mak, Project Administrator of EnviroLab Asia, at kmak[at]cmc.edu. While this is an interdisciplinary initiative, each student will be assigned to a Class Clinic Lab. See above for descriptions of each Lab. Please describe how you are a good candidate for each Lab. What do you hope to learn? What questions would you like to explore? What past experiences make you a good fit? How would you contribute? Please write a separate answer for all four Labs. Please limit each response to 150 words or less. Please provide the name and email of one faculty or staff member who may serve as a reference for you. Is there anything else you would like to share (in 100 words or less)?